There's a new baby in the house! 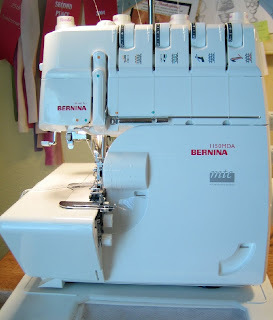 Meet Sergei....my new Bernina serger! We got together last Thursday and have been working as a team for the last several days. I just love sergers! This comes from a person who spent years not understanding why people would ask if I had one of these things because of all the sewing I do. You see, I was a late convert to the serger world. I didn't see what all the hype was about. I owned my first serger only 8 years ago after spending many years making clothes and finishing my seams by trimming and then zigzagging the edges like a good responsible seamstress, so that the inside of my finished clothes would look as neat as the outside. What I wasn't realizing was how much time I was spending to do that! Imagine my dismay as I began sewing the majority of the seams in a garment with a serger....wow! I was fast before, but now I am like greased lightning! I came to understand why people had asked me all those years if I owned one of these things....and I could kick myself for not buying one sooner! Here's the deal. I think most of us look at 4 spools of thread hooked up to ONE machine, see all those moving parts cleverly hidden behind the lower compartments and begin to break a sweat! It is intimidating to see that thread going through all sorts of gizmos and feeding somehow through to the presser foot....I know I thought to myself, "How will I ever learn to thread this thing?". Once you understand that there is an order to the threading chaos (quite literally...they NUMBER the steps! ), and that every dealer is more than happy to set up time to help you get the gist of this, it becomes much easier to think that you CAN use this machine for sewing with professional results. I know there are those of you out there that bought a serger or had one given to you X number of years ago and it has just been sitting there collecting dust....if you are making clothes, get that thing out and start using it! Even if you are a quilter that doesn't really make clothes, there are a lot of ways you can use a serger. Lots of folks use them to give a finished edge to their quilt tops before having them professionally quilted. This assures that your edges stay nice and neat through the quilting process. It is also a great way to keep fabric from fraying along the cut edges if you like to wash your pieces before sewing with them. If you ever alter denim because they make all jeans too long (for me, anyway), it is a great way to finish those cut edges before turning up for a new hem, and it eliminates your having to turn up that thick fabric twice because now you have a finished edge! There are still some seams that I don't serge. One good example is a set-in sleeve. You are usually easing in extra fabric along the sleeve edge to fit the armhole. This is to give you extra room to move around once the garment is finished. 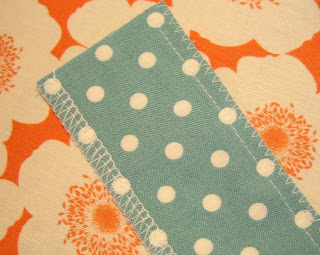 I initially sew this type of seam with a straight stitch and then move over to the serger to finish it out. Also, I usually just do a plain seam on an edge that will need to be clipped because of curves before turning, like on a facing at the top of a skirt. These seams are hidden when the garment is finished anyway, and clipping along the seam on a serged edge is not good, as you can clip through the threads holding it together. Sergers range in price from very economical to crazy expensive, depending on what they are able to do for you. If you are looking for a machine that will do the basic stuff for internal seams without a lot of bulk, you can be set up for around $200-$300....not a huge investment. That is what I did when I started out with a serger. I had to try it out to be sure it would work for what I did and that I would be able to get along with this new creature! My old machine was a Janome 204D and still works great. I just decided that I wanted a few more bells and whistles that it didn't have, but I would recommend that little Janome to anyone who is interested in getting their feet wet with the world of serging.